Seval’s music is acoustic, sonically rich, emotionally uplifting, cozy and airy, playful, panoramic and passionate, rooted in jazz but doesn’t stop at jazz’s border. The quintet has a sound truly their own. Computers ‘think’ in 1’s and 0’s. Humans… enjoy the concept of 2. Seval returns with its second record, 2; a record for humans. Leaner, meaner and harder than Seval’s debut i know you, and this time on compact disc, the new album of songs continues to explore the interstitial spaces in between pop, jazz, new music and, of course, free improvisation, while not losing its sensitive melodic core. Unlike the first record, made when the group was only expected to be a one-off project, 2 benefits from a few years of mutual experiences and many gigs around Europe. Building on the strengths of the members, this time the material was specifically written for the band, rather than the first, which featured songs written by Fred Lonberg-Holm for other projects. 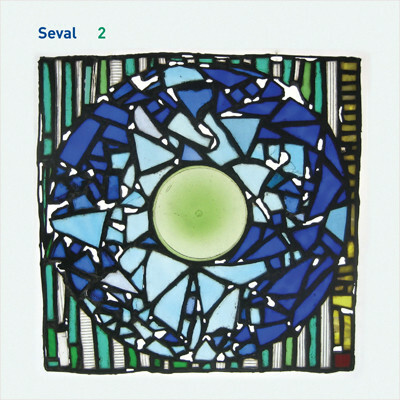 While on the surface Seval has always been perhaps more accessible and pleasant than many of the members’ other projects, more attentive listening reveals a complex core full of details that most song projects might filter out. While the first record focused almost exclusively on personal relationship issues, this time the lyrics range from the overtly political (“revolution” and “details”) to the abstract philosophical (“boredom” and “super seeded”) as well as the more personal (“light brush” and “flowers”). Still the band focuses more on the music than the lyrics. The words remain constant but the music changes markedly from version to version, from night to night, as the group’s method is to improvise around the lyrics. At times outright difficult, at other times achingly beautiful (check out “simple flowers”), the melodies surprise and delight, both in performance and upon repeated listenings of a recorded version. Regarding the inclusion of some more challenging tunes on 2, Lonberg-Holm says, “the first record was almost too pop for many folks here [in Europe]. Fortunately they gave us a chance and liked how the live versions have more ‘breakdowns’”! The takes on this disc, then, reflect a particular day’s approach and can’t be expected to be re-created the next or at any future gig. All Seval can promise is to try to make a version and try to make it make sense at that moment. Like the disc title 2, it’s a band that tries to makes sense of the universal human language, music.